Another year. Another Super Bowl. Another opportunity to skip town with zero traffic on the roads. Man, but I do love Super Bowl Sunday. I’ll admit it: this year’s Un-Super Bowl Sunday didn’t have the same epic road-trip quality of my last Un-Super Bowl Sunday. That one was so epic it managed to get me highlighted on WordPress’ Freshly Pressed page. No matter. The skies were clear, the temperatures warmer than normal and, with the 49ers one of the teams playing in the big game, the vast majority of Northern Californians elected to stay home and watch. Which was absolutely fine with me. 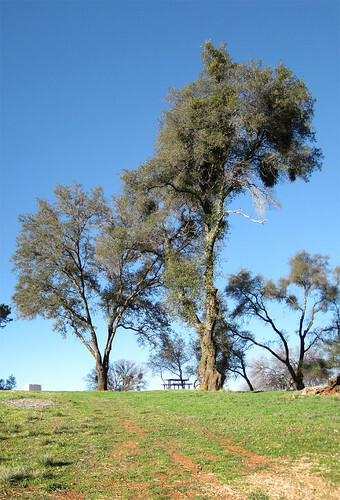 I started the day picking up a Sunday Paper, then heading up to Hidden Falls Regional Park. 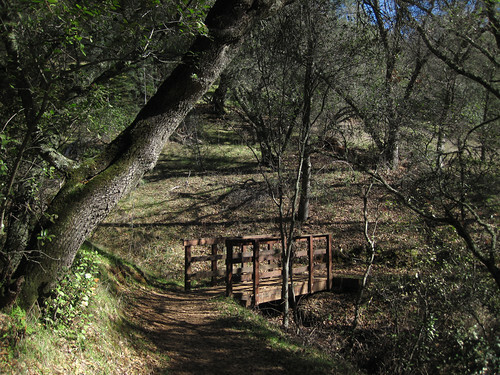 As you may recall, this was the park I did the volunteer trailbuilding at a couple of weeks ago. This visit, however, was strictly recreational. After a short drive down mostly empty freeway and deserted back-roads (this, despite the fact that the game wouldn’t be starting for another six hours or so), I parked in the mostly empty lot, shouldered my pack, and headed down into the canyon. I had no planned route, no timetable, no specific goals. Instead, I wandered around the park’s many trails, consulting the map at trail junctions, and putting together my course as I went. In the end, I managed to cover most of the park, from ridge tops down to creek bottoms. I passed hikers here and there, but was mostly alone, apart from the cries of mating red-tail hawks and the turkey vultures soaring overhead. 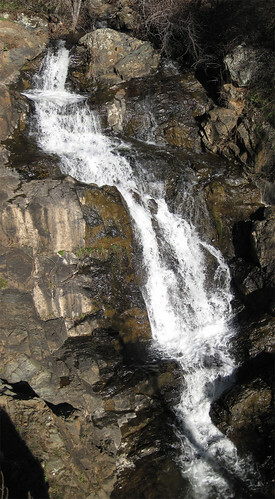 Eventually, I ended up at the park’s namesake waterfall, easily viewed from a nicely built platform. Does a waterfall count as “hidden” if it has a viewing platform? It was there that I encountered a small, screaming child, whose parents looked at me and apologized for ruining my peaceful stop at the waterfall. I replied that there were “no worries” (shades of Australia reside within me, I suppose) and asked what the problem was. Turned out the tyke had a large splinter in his hand. A few months ago, his father said, such a thing would have been “no problem,” but that now the child had “gotten to that age where every little thing has to be turned into a dramatic event.” He said this with a knowing smile, and I noticed his son’s older sister was looking at her brother’s “tragedy” with bemused interest. I pulled out my first aid kit and volunteered my tweezers, which made short work of the splinter. Handing them a band-aid and some Neosporin, they thanked me profusely as they bandaged up the wound and, tears starting to subside, headed on their way. And spent the remainder of the afternoon basking in the sun while reading the headlines. As the sun set, I left the park, picking up the nearly deserted highway back to town. 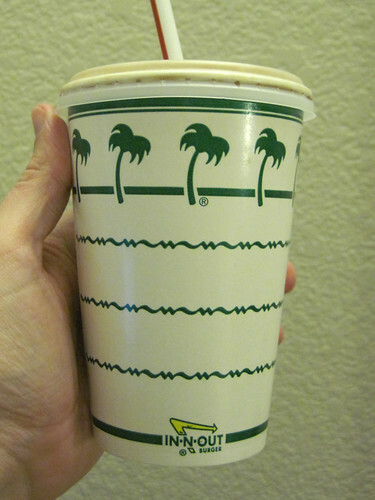 On the spur of the moment, I decided to treat myself to dinner at a nearby In-N-Out Burger (fries “well done,” thank you). Parking in the empty parking lot, I walked in to discover something I’d never seen before: an In-N-Out with only five people in the dining room. And no cars in the drive-thru. On a Sunday. At 5:30. Those of you who don’t live in California may not understand the significance of this. In-N-Out’s usually have packed dining rooms. It’s not uncommon for the drive-thru line to have 15 or more cars waiting in line… all day. Were it not, in fact, for it being Super Bowl Sunday, most Californians might readily accept an In-N-Out doing so little business as a sign of the apocalypse. But it’s not the apocalypse. So, I bought myself a chocolate shake to celebrate. And returned home to finish off the part of the Sunday paper I always mange to save for last because it’s the absolute most important part: the Comics. 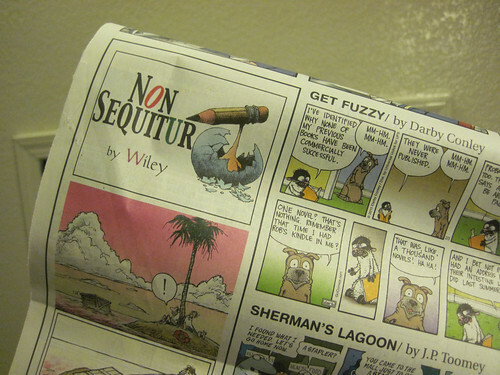 Why, yes, I DID specifically turn the page to Non-Sequitur, thank you! Was it an epic Un-Super Bowl Sunday? Nah. But any day that starts with a good hike and ends with a tasty chocolate shake, with the added bonus of being free of crowds everywhere, is all right in my book. « Friday Sillyness: Make A Decision! Wow what a wonderful way to spend any day! I loved your story about the emergency “splinter surgery”. A stranger removed a splinter from my foot when I was young and I still readily remember his kindness! This may seem like an odd question after such a lovely post, but since you mention how ‘deserted’ the joint was, I wonder: Are you ever worried about hiking alone? Either concerns about critters or other people, or what would happen if you get hurt? Or do you just say, “Eh, there are risks, but not enough to keep me out of the parks”? Sounds like a nice day. I spent the day driving home after our dog sledding trip. Actually I slept while Wife drove home. I like to find something to do during the superbowl too! Was it cold outside for your hike, because it looks so gorgeous outside in your pictures! Glad you had a good day for it!